Brandon Samuels plans to set up cameras this January in hopes of catching footage of birds crashing into windows across campus. Honestly, he really is a nice guy – it's for science. 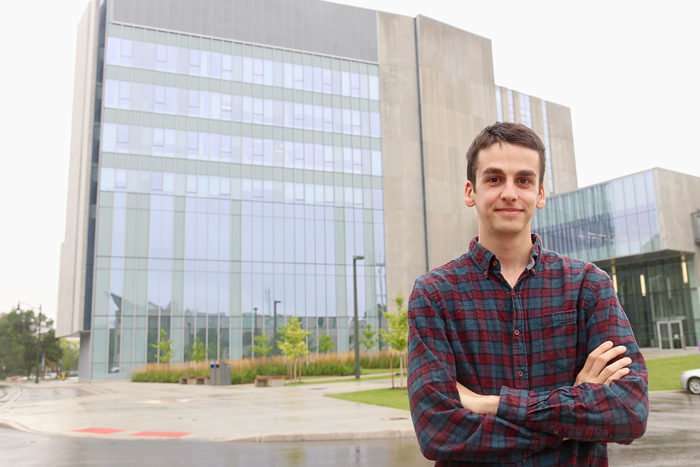 The Neuroscience Ph.D. student is working on ways to help mitigate the number of birds colliding with large glass structures on campus – and beyond – by better understanding the visual perspective of the birds prior to impact. "We don't know what a bird is looking at when it's flying," said Samuels, who recently completed his masters at Western. "There is a statistical way of looking at how many birds collide – where and when. But I'm interested from the perspective of morphology. I want to look at it from the bird's eyes – how they see, how their vision contributes to being able to see or not see an obstacle. "Bird vision is very different from species to species. You have owls with huge eyes on the front their head and you have little birds with eyes on the sides of their head. You would imagine they see the world quite differently." There are a number of reasons that may cause a bird to fly into a window. They could be trying to pass through an area as if it was not there. Maybe they cannot distinguish the actual natural landscape from what is reflected on building surfaces. Maybe they cannot navigate in open spaces when taller structures reflect the blue of the sky. "Unlike a downtown core, Western's campus has a lot of green space, which is lovely. We enjoy it; the birds enjoy it. But when you have glass like this, mixed in with trees and green cover, that's where the risk really lies." Samuels' research hopes to determine what species are most prone to colliding with windows and why in an effort to create building design elements to diminish the likelihood of strikes. After finishing his undergraduate studies at the University of Guelph, Samuels came to Western to explore how birds and humans perceive aspects of music, specifically in rhythm and the sense of the beat. When talking to people about his work, it was always "a very abstract, intellectual discussion." He continued, "I craved something a little more applied. A lot of birds are in peril and desperately need our help. I saw myself in a unique position to be able to make some recommendation into improving Western's campus – and beyond – according to their (birds) sensibilities. This is an international issue. It happens everywhere there are glass structures. It can be a simple window on your home or a large skyscraper." 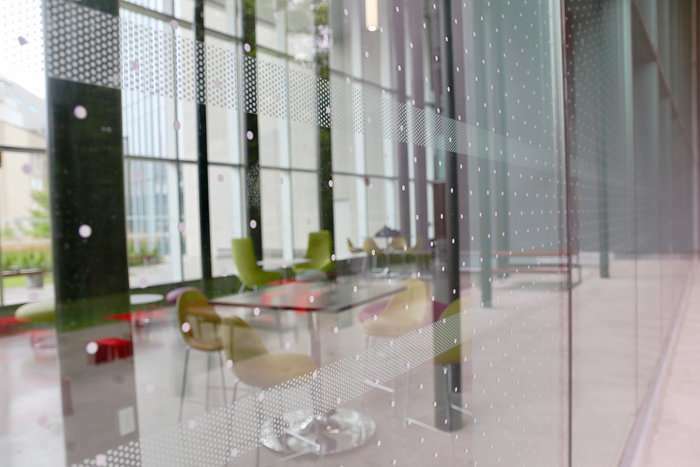 When it comes to a building like Western Interdisciplinary Research Building (WIRB), Western has taken measures in an attempt to lessen the occurrence of birds striking the new seven-story glass structure. Stripes and dotted windows now face the forested areas behind the building. "I would suspect a majority of people that walk through this hallway don't even notice those. It's a subtle thing. 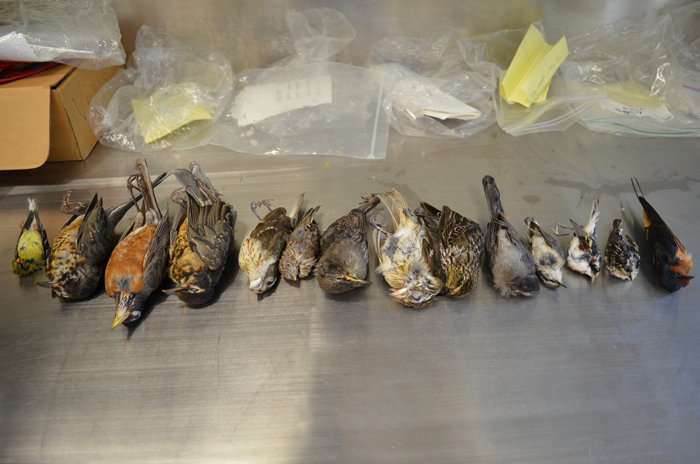 But from the limited evidence we have, this may actually save many birds every year," Samuels said. "It is things like this that we can do to subtly modify how we treat current buildings. When erecting new buildings that might make all the difference for preserving these species." Not all window treatments are successful – fake owls or bird silhouettes taped to a window, for instance. Yet Samuels admires the mindset. "Anything you can do to put on glass is better than nothing." Once he obtains footage of the birds striking widows – with the four cameras he will place at various spots across campus – Samuels will get an idea as to what a bird is experiencing at the moment of impact and what, if anything, could fix the problem. "It could be the bird detects the obstacle at the last-possible second. Or, if a bird is looking with two eyes straight ahead versus turning its head and looking with one eye, that vision is very different," he explained. "If we're going to design treatments for the glass, we should know what part of the eye we are catering to. We need to know whatever can be done is going to work for the birds." Samuels hopes to set up an online portal where faculty and staff can report where and when a bird might have struck a window in their building. "I'm not going to be the hero in the cape to save all the birds. I am not going to change the world overnight. But I'm looking to making vital contributions. You need to deliver a strong argument for change and you're not going to create that until you have evidence."